Willowy Whisper’s Cover Design (http://willowywhisper.com/?page_id=1271). Short story must be between 1,000 to 5,000 words. Stories exceeding that limit will be automatically disqualified. No profanity, sexuality, inappropriate romance, or non-Christian elements. 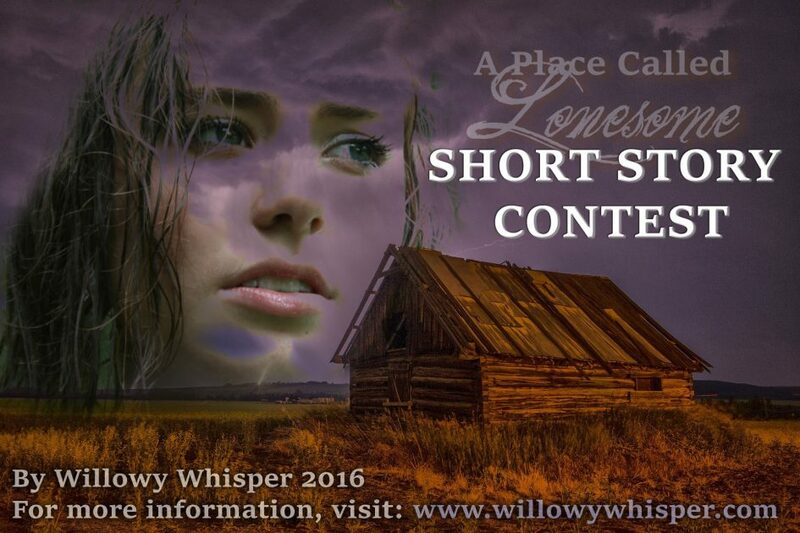 Story must makes sense with the chosen title: A Place Called Lonesome. Document(s) must be sent to my e-mail (will be provided after a sign-up) in a PDF format. No other format acceptable. Font must be Times New Roman, Georgia, or Ariel. Font size must be 12. At the beginning of the document must be the following: name, age, e-mail, blog/website (if exists), and word count. All stories will be judged solely by myself, Willowy Whisper, and will be judged to the best of my discernment. The winner will have their choice of a cover (front) or a promotional graphic. Details will be established between the winner and myself. The winner will be based on a number of things. I will be looking, first and foremost, for a story that goes along with the title—and still makes sense. I’m looking for imagination, creativity, and a skilled plot-line that really grips my attention. (The story does not need to go along with the contest banner, just the title). Also, I’m looking for developed characters. I want characters I can love and relate to. But this is a writing contest. Pull me into the story, make me feel for your characters. Let me know I’m in good hands. Structure your sentences, proof-read excessively, and try to let your words flow together—all the while leaving room for your own taste to seep through and shape the story’s world. Have fun creating a beautiful short story! Please just scroll down and fill in the information, and I will e-mail you promptly. I entered! I don’t know with 100% certainty that I will be able to do this, but I’m going to give it my best try. There are a few other things demanding my attention right now, but I’m going to try my hardest! This is such a good idea! Quick question, when does this story contest end? I haven’t set a certain date, because I wasn’t sure how many or how little entries I would get. I wanted to be able to close the contest just as soon as I felt there were enough participating.